It's back-to-school time. I heard from a teacher this week who was frustrated that her repeated request to order additional textbooks last year had fallen on deaf ears. The new school year is here and she doesn't have enough books to pass out. My solution? Just be sure the student with the squeakiest wheel parent is among those without a book. Once momma or daddy bear find out that their little one doesn't have a book, I can pretty much guarantee they will ride the proper fannies until said textbook appears. I've had a love/meh affair with textbooks since my career started. My first job came with a classroom set of books as the district was too poor to purchase enough books for the 1200 students at my school. Being young and inexperienced, my workaround was to pre-digest the info in the text for students and then have them take notes and do some labwork. Looking back, I really wish that I'd known more about reading strategies and helped students make use of the books we did have. It's true that science should be inquiry-driven---and we did lots of "canned labs" 20 years ago. But it is also true that there is sense to be made from text. What I learned over the years was that textbooks really did serve a purpose in the classroom. They were not used everyday, and my last year in the classroom was much like my first in that I did not have enough books to assign to individual students. But what did happen is that the students and I learned to make meaning together---to read and interpret graphics, to build vocabulary so we could talk about scientific concepts, to learn how to use text features to find information, to learn to organize ideas. Reading became an integral part of instruction. Is that really so bad? I have no doubt that textbooks are sticking around because of tradition and money. But I don't think those are the only reasons. Perhaps we need to stop for a moment and think about whether or not textbooks should be demonized, as well as whether or not they need to go away. Is it possible that some books are "bad" merely because they exist? Should our platform be that we tell children that books are great and students should read all the time...except for textbooks? How do we explain to kids that "The Cat in the Hat" is okay to read over and over again, but an Algebra book is not? Where does a regular book end and a textbook begin? Shall I toss out the Divine Comedy because Dante's work served as textbooks for college classes? Digital content has its advantages over print. It can be easily updated, and large amounts of information can be cheaply stored in small places---all delivered on demand. But part of the "hard sell" states are facing is that there is no educational research that shows that digital content improves learning. Perhaps texts don't, either, but if you're going to dethrone them, you'll have to prove that digital content is better for students in meaningful ways. Strategies for reading online text are scant. I'm not saying they don't exist or can't be developed, but reading from a computer screen is different from reading print. Nearly all of the strategies we currently use for pre-reading and during reading do not transfer well to a digital environment. It is possible that with time, the tools will catch up with the digital format---we will be able to annotate and move between content and notes with grace. Right now, the few options available are clunky. We are not only going to need to invest in new tools, but an incredible amount of PD to help teachers learn to teach reading via digital content. Right now, it's a helluva lot cheaper to replace a textbook (even at $80) than to replace a damaged laptop/netbook/eReader, purchase licenses, and upgrade teacher knowledge---all for an unknown trade-off in learning. We're also not seeing a lot of demand from students that text go digital. Sure, it sounds like a great idea in an era of scoliosis-inducing backpacks, but the current capabilities of eReaders are limited (at best) and the current struggles over content ownership make it nearly impossible to bend the content to students' needs and abilities. Smartphones and netbooks will help, but I think it will be some time before we see the tide turning. In thinking about all of these threads, I am continually surprised at the number of educators who think textbooks are evil. Maybe we don't need a "radical change." Maybe we need to just help students learn how to learn. 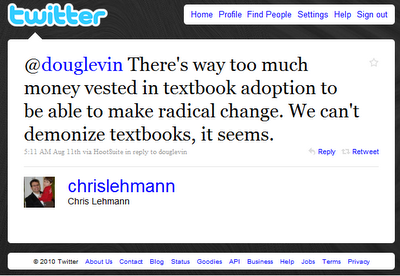 Textbooks are not perfect, but like anything else in the classroom, they're tools. You can use them to good or bad ends---the choice is yours. I agree - textbooks are a tool. I have a limited number so only assign them to the honors class (who I expect are able to do more reading on their own outside of class) and to the lowest level class (who I've found need extra time with the text outside of class to fully understand). For the rest, I have a class set always on the table and a set I can check out as needed. They actually do get checked out quite a bit - but usually around vocabulary time (even though I have all vocabulary on the website, and most have computer access!) We'll often be discussing and I'll off-the-cuff decide to turn to a page in the book - I don't even know the book so well I can just recall a chapter. But this gives me an excellent opportunity to model - look in the Table of contents... find the topic... Then I also use this again if students have questions I know are easily answered from the textbook. It is a tool - an imperfect one to be sure (there are 12 chapters that have nothing to do with my subject in our current textbook), but it is a useful tool. I worry about e-textbooks for many reasons - despite being a technophile personally, and having one of the showcase rooms for technology in the school (I have a tablet to give notes on instead of an overhead), I'm slow to throw out the old ways before fully field testing the new technology. And there is good reason - I recently read a research study that showed our digital natives tend to read more superficially when looking at content on the internet - so they don't extract as much reading from what they read, even if they are reading more of it. I hate to give a source, without giving the link or more detailed information, but I've been doing a lot of reading this summer and must not have added that study to my delicious tags - if anyone else out there has the link, I'd love to re-read the article!